Description: Sweeper® Waterhousea is a heavily weeping form of Waterhousea, with gorgeous lush new growth and an elegant rippled leaf. It produces large clusters of white flowers in summer and its foliage is much denser. 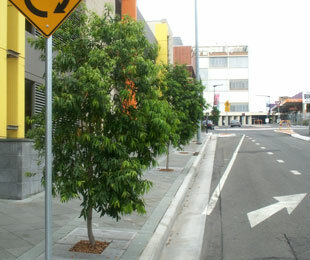 Excellent for large dense screening, a street tree or planting near hard scapes, as it creates a softening effect in a harsh concrete environment. 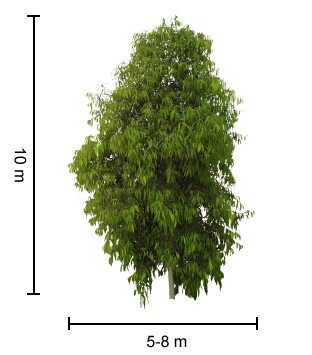 Size: 10m high x 5 – 8m wide. 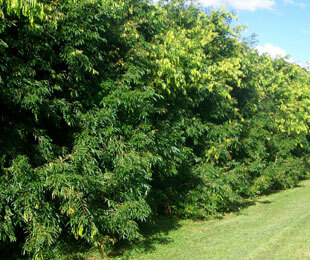 Uses: Ideal for street tree, large dense screen or hedge. Not suitable for courtyards or small gardens. Position: Full sun to part shade. Avoid hot or dry exposed inland regions. Tolerates cold and drought. Sweeper® Waterhousea suits well drained to heavy clay loams. Care: Water as required for 8-13 weeks until established, top up water in dry periods. Plant in a well mulched garden (chunky mulch is recommended). If required use slow release fertiliser in spring. Trim every 2-3 years if required. Where it works: QLD, NSW, VIC, SA & WA. For more detailed information on Sweeper® Waterhousea click here.